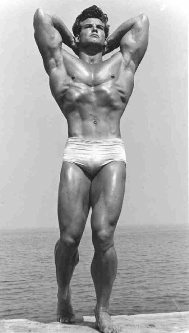 The Gray Iron Fitness Newsletter, Issue #128, Was Steve Reeves a hothouse plant? Was Steve Reeves a hothouse plant? The Steve Reeves page in my "Muscle Stories" section gets more visitors than any other. They arrive after doing Internet searches for his diet, his workouts, or wanting to know where he worked out . . . Steve Reeves questions go on and on. A lot of people ask, too, if he was truly strong, or did he just look strong? In other words, was he merely a poser? With certain exceptions -- Grimek, Hilligenn, and Tommy Kono, come to mind -- most Mr. America type bodybuilders are not nearly as strong as those who train primarily as lifters. And Steve Reeves did not train for competitive lifting. His primary goal was to build his body as close as possible to the classic physique, like sculpture from classical antiquity. He even had a formula, "The Standards of Symmetry," that listed ideal proportions, according to a person's height. He certainly achieved those proportions, and many people believe he was the most symmetrical bodybuilder of all time. But to answer the original question: was he strong, or did he just look strong? Well, he was not as strong as, say, Grimek, John Davis, or Doug Hepburn (world class champion lifters of that period). But Steve Reeves was strong. No doubt about it. Strength & Health's editor, John Grimek, told a few stories about Reeves' strength that he personally witnessed at the famous York Gym. You can find them at the Steve Reeves page. I think you'll agree that he was more than adequate in the strength department. Off and on, I have lifted weights or practiced martial arts most of my life. I was never exceptional at doing either one, but did reasonably well and could hold my own. As I grew older, I pushed myself pretty hard for as long as I could. However, by my late 50’s I often had to coax myself out of bed in the morning following a session of martial arts sparring or grappling; and I began having low-back pain. I would rest until it felt better, and then I’d go back for more, with the same result. It isn't that uncommon. Hang around any gym and you find older guys doing what I did. They are basically fit, but stubborn about making adjustments in their training. Eventually I “listened to my body,” as they say, and made age appropriate changes. I still trained with weights, of course, but switched from martial arts with contact to leading cardio-kickboxing classes, where you go through fighting motions kind of like shadow boxing, but no one hits back or tries to bend you like a pretzel. It was great fun and a heck of a good workout. 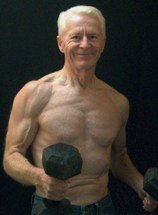 In my late 60’s, I began experiencing some shoulder pain following resistance training; a couple of times it was painful enough to take a cortisone shot. Just as I had done with martial arts practice, I would work around the pain until things felt normal again, and then return to the same routine. And as night follows day, my shoulder aches would return. Finally, rational thinking -- plus nagging shoulder aches -- overcame my stubbornness. I began looking for what it was, exactly, that my rotator cuff disliked about my training. It turned out to be the bench press. I tried switching from barbells to dumbbells, changing the angle of the bench, and, finally, using weight machines. A couple of the adjustments helped somewhat; but in the end I found out the bench press, in any form, seemed to cause more trouble than it was worth. Strangely though, I found I could do various types of push-ups, even with weights on my back, without it bothering my shoulders. I’ve been doing them ever since. Aside from the aforementioned realities of aging, I was able to maintain my strength and pace throughout my 50’s and 60’s. As I entered my 70s, however, I began to notice that I needed more rest than before, and that I had to ease up in training. Overdoing it is much too common at any age, but the consequences can be particularly problematic for seniors. Recognize and accept that training adjustments have to be made as you age. Yes, each of us has a unique capacity. But, generally, what we could do at 50 probably will be too much or too hard at 60 or 70. Never quit, but adjust and adapt. The more frequent your training, the more abbreviated it should be. Usually, it is not so much the device or kind of equipment you use. It is how you use it. Free weights; resistance bands; bodyweight exercises; kettlebells; and, yes, even exercise machines may serve you well – if the use is age appropriate. Never try to “work through” tendon, ligament or joint pain. This kind of pain is entirely different from benign muscle soreness. “Pain is just weakness leaving your body,” is a phrase to prod young recruits in Marine Corps boot camp. You hear it in sports, too. Be careful. That kind of thinking can lead to trouble for seniors. If something aggravates a problem area, stop doing it. Balance your training. Resistance training is the most important component to stave off sarcopenia, but reasonable cardiovascular exercise and some flexibility movements should also be included. If you are regularly still tired following workouts and a good night's sleep, you are overdoing it. Your workouts are too long, too frequent, or too intense. Your body is pleading. Listen to it. Adjust and adapt. Train for your whole life. But for lasting strength and longevity, stay within realistic guidelines.